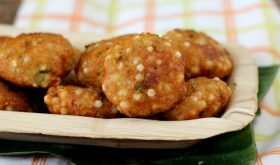 Sabudana vada recipe is an addictive, tasty and easy to make Indian snack. It is a popular Maharashtrian snack prepared with sago aka tapioca pearls and is made during for fasting days (vrat). Down South it is called sagubiyyam vadalu in telugu and javvarisi vadai in tamil. 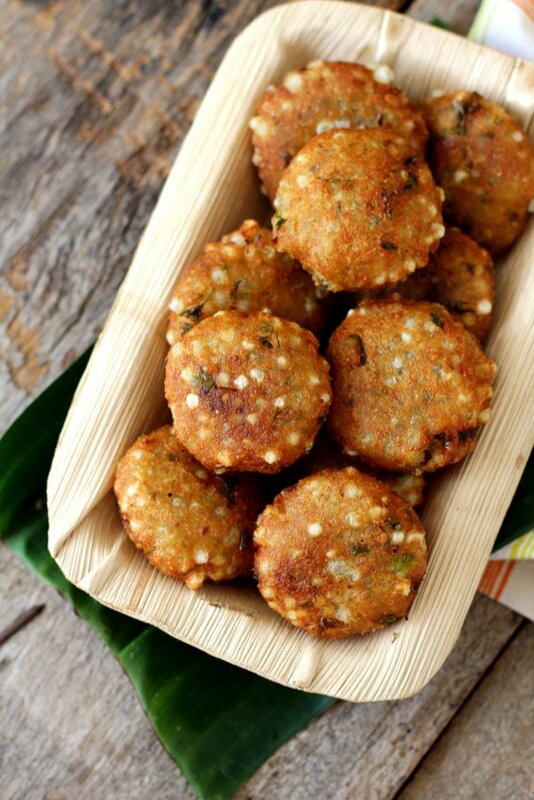 Roasted peanuts is an essential ingredient in sabudana vada which has a crispy exterior and a soft interior. Its a perfect fasting food to make during vrat if the entire family is on fast keeping in mind it is a kid friendly snack. 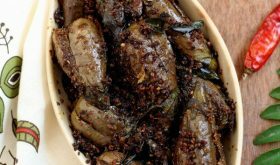 It can also be served as finger food/starter for parties or as an evening snack with a cup of chai. While preparing sabudana vada recipe, ensure you use good quality medium or large sized sago pearls and do not soak them in water. If soaked in water, they will asborb a lot of oil while being deep fried. Its best to allow the washed sago to sit in a few tablespoons of water for one or two hours. Do check out more sabudana recipes for fasting days like Mahashivaratri or Navratri. Find below sabudana vada recipe with easy to follow steps and tips to make it crispy. Wash large or medium sized sago and strain the water. Sprinkle 1/4 cup of water over the sago, place lid and set aside for 1 1/2 to 2 hours. Pressure cook the washed potatoes till soft. The potatoes should not be mushy but just cook till soft. Peel and grate the potatoes in a large bowl. Add the sago, arrowroot powder, coarsely ground peanut powder, chopped green chilis, coriander leaves, lemon juice, sugar, salt to taste and mix well. Make large lemon sized balls out of the mixture and lightly flatten them. Place them in the fridge for a few minutes. Heat oil for deep frying in a heavy bottomed vessel. Once the oil turns hot, reduce flame to medium and place 3 to 4 vadas carefully in the hot oil. Deep fry till golden brown in color and carefully remove them and place them on absorbent paper. Try to use large or medium sized sago pearls instead of the tiny variety. You can also add 1/2 tsp cumin seeds and 1/2 tsp grated ginger to the mixture. If arrowroot powder is not available, you can add kuttu ke atta (buckwheat flour) if you are eating the vadas as fasting food. 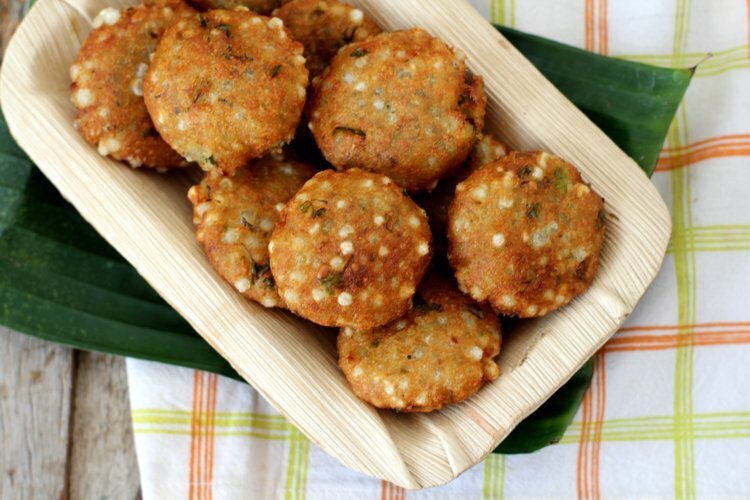 If you are not eating the vadas as part of your fast, you can add a tbsp of rice flour to the mixture for a crisper texture. Beautiful photographs and I am sure it tasted great. looks yummy. what is Arrowroot powder ?